This apparently new addition to the Seiko Core family is a watch that spreads over the classic, sporty and dressy styles at the same time. An excellent fit and finish being integral, the Seiko Chronograph Quartz Alarm SNAF69P Men’s Watch is a solid piece that feels good on the wrist. 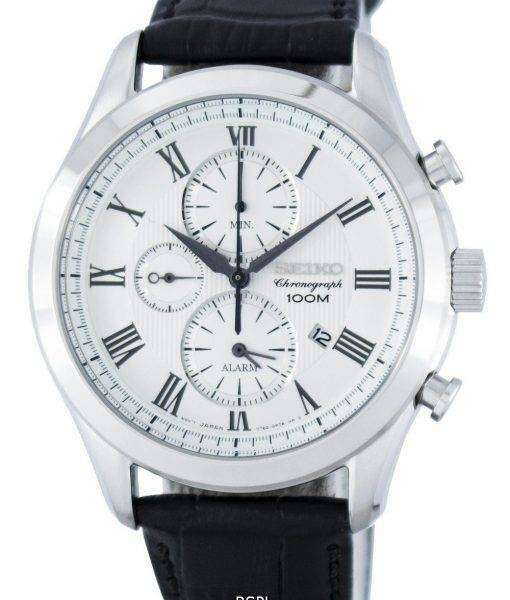 The Seiko Chronograph Quartz Alarm SNAF69P Men’s Watch is a well made piece, constructed entirely out of stainless steel, from the case to the screw-on case back, which provides extra protection against water-related damage. It also enables the watch to withstand water pressure till 300 feet (at least), which secures the watch against rain and accidental splashes. With a leather strap, you’ll certainly not going to take it intentionally for water-related activities. The dial of the Seiko Chronograph Quartz Alarm SNAF69P Men’s Watch comprises three sub-dials; at 9’o clock, it’s the regular seconds; at 6, the alarm and dual-time showing counter and at 12, it shows the chronograph minutes in 1/5th second increments, imparting it a mechanical-like smoothness. The chronograph can track time up to an hour before resetting. It also allows split-time calculations, where you can stop the chrono-seconds hand from advancing till you note down the reading and advance again to keep continuing the count. The watch keeps track of the lapsed seconds internally and catches up immediately as you put it again into action. From the top, it’s covered with a Hardlex crystal, Seiko’s proprietary mineral glass. The Roman numerals are large and look very classic and formal. They're easily visible and the white background facilitates the visibility all the more. Since meant to be used entirely in an urban setting, it has not been given any lume. While the stopwatch is easy to work with, some might find the procedure to set the alarm of the Seiko Solar Titanium Chronograph Men’s Watch a bit lengthy. However, it is loud enough to wake you up from your afternoon nap or mark the end or start of an event. Under normal operation, the alarm time advances as that of the time shown on the main dial. Or, you can set it up to show time in a different time zone. In that case, the alarm function will be disabled. Meant to repeat once every 24 hours, you can set it only to beep according to the time shown on the main dial. The Seiko Chronograph Quartz Alarm SNAF69P Men’s Watch is a fairly lovable piece to sports enthusiasts and highly adorable to urban folk who want a bit of sportiness in a regular-wear dress watch. The Seiko Quartz Chronograph Men’s Watch is anything but flashy; therefore, highly recommended as an office and business wear.